You are buying a new HO 1/87 A-Line # 50605 Auto Carrier Trailer Kit. Note: this is a kit that must be built and does not include a tractor. You must provide tractor and paint a color of your choice. This semi is a Kenworth Aerodyne- it looks very similar to snowman's kenworth w900 though ! 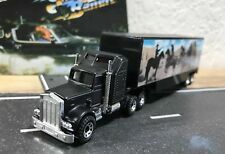 Matchbox semi and trailer custom painted to look like snowman's smokey and the bandit kenworth w900 ! Look at the pictures! Free wheeling, Modern truck with Authenitc markings. Free wheeling, Modern truck with Authentic markings. Detailed inside with steering wheel and rows of seats. THESE UNITS HAVE SMALL PARTS AND ARE FRAGILE. TRUCK STOP HOBBIES CAN NOT ANTICIPATE THE COST OF THESE FEES AND IS NOT RESPONSIBLE FOR THE FEES. • Tonkin Replicas: Model #95181. "H, clear plastic box box size is approx. 11.5"L x 1.75"W x 2.5"H, detailed cab interior, a nicely painted and detailed truck, see complete details be low. Nicely detailed semi tractor 1/87 HO scale for an HO layout, or as a stand alone collectible model. Diecast models are hand painted with pad printing, no decals are used. Nicely detailed collectible 1/87 HO scale model for an HO layout, or as a stand alone collectible model. • Oxford Diecast: Model # 87TR013. Item Number:RT1037. It features high quality parts and free motion wheels. I have lots of Wiking, Lesney Matchbox, Tomica, Hot Wheels, Corgi, etc. for sale. • Manufactured by Promotex. Display this semi trailer on an HO layout, or as a stand alone model. • Display this low boy on an HO layout, or as a stand alone model. Perfect for the HO layout, or to display as a collectible! You are buying a new HO 1/87 TNS # 582 Peterbilt 389 w/48' Spread Axle Flatbed Trailer 2-Tone Green - NEW FROM TRUCKS N' STUFF! THESE UNITS HAVE SMALL PARTS AND ARE FRAGILE. • Tonkin Replicas: Model #95211. • Kenworth T700 Sleeper with 53' Trailer with skirting. Nicely detailed semi tractor 1/87 HO scale for an HO layout, or as a stand alone collectible model. • Scale/Gauge: 1/87 - HO. You are buying a new HO 1/87 TNS # 3183 Kenworth T-700 w/Racing Transport Trailer Chevron/Delo. THESE UNITS HAVE SMALL PARTS AND ARE FRAGILE. • Tonkin Replicas: Model #95235. • Kenworth T700 Sleeper with 53' Trailer with skirting. • Logo: U.S. XPRESS ENTERPRISES. Nicely detailed semi tractor 1/87 HO scale for an HO layout, or as a stand alone collectible model. 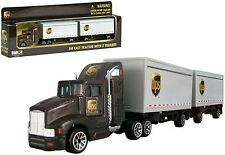 Consolidated Freightways Die Cast Truck 113-035 with original box. The box on one end missing the end flap. Condition is Used. See pictures for better description. Not perfect. Some nicks easy touch up. Payment is due within 2 days of aucrion ending. No returns. Trailer is about 7 nches long.is new in original bag. made by Promotex in Canada. Reefer Refrigerator Trailer 53' 1:87 Scale. 1/87 Scale Accessory. Sorry, no international orders! Tonkin trucks are for ages 14 and up, and are not designed to be played with. Tonkin Trucks are not for children under 14 years old, and are not made for play. Tractor w Trailers. 1/87 Scale Vehicle. Trailer is about 7 nches long.is new in original bag. made by Promotex in Canada. Dry Van Trailer 53' 1:87 Scale. 1/87 Scale Accessory. Sorry, no international orders! Athearn HO 1:87 Ford C-cab and chassis w/resin sleeper cab casting. You are buying a new HO 1/87 GHQ # 62001 - 50 Ton Low Boy Trailer KIT. NOTE: this is a kit that must be built and decorated to the color of your choice. THESE UNITS HAVE SMALL PARTS AND ARE FRAGILE. 11.5" long, manufactured by Promotex, see complete details below. • Manufactured by Promotex. Nicely detailed die-cast model 1/87 HO scale for an HO layout, or as a stand alone collectible model. Made by Promotex in Canada. Silver Gravel Trailer. 1/87 Scale Accessory. Sorry, no international orders! Trending at $14.80eBay determines this price through a machine learned model of the product's sale prices within the last 90 days. You are buying a new HO 1/87 GHQ # 62002 - 1950's Low Boy Trailer KIT. NOTE: this is a kit that must be built and decorated to the color of your choice. THESE UNITS HAVE SMALL PARTS AND ARE FRAGILE. You are buying a new HO 1/87 Promotex # 5488 - Spread Axle 48' Highboy Flatbed Trailer - silver. THESE UNITS HAVE SMALL PARTS AND ARE FRAGILE. • Manufactured by Herpa/Promotex #5490. Display this semi trailer on a HO layout, or as a stand alone model. • Display this semi trailer on an HO layout, or as a stand alone model. • Scale/Gauge: 1/87 - HO. Trending at $10.99eBay determines this price through a machine learned model of the product's sale prices within the last 90 days. HO 1/87 Herpa # 83577 Tires & Wheels, Chrome W/O Axles For Trailers 60 PCS. Produces 30 axle sets of wide single trailer tires. THESE UNITS HAVE SMALL PARTS AND ARE FRAGILE. You are buying a new HO 1/87 TNS # 584 Peterbilt 389 w/48' Spread Axle Flatbed Trailer Green/Black - NEW FROM TRUCKS N' STUFF! THESE UNITS HAVE SMALL PARTS AND ARE FRAGILE. Made by Promotex in Canada. 27' Trailer w/o Converter Dolley. 1/87 Scale Accessory. Sorry, no international orders! Promotex 40' tandem axle semi trailer with reefer unit, white in color, or can be painted any color you wish, made from quality injection molded plastic 1/87 HO scale, nicely detailed, manufactured by Herpa/Promotex, includes spare tire and removable dollies, see complete details below. THESE UNITS HAVE SMALL PARTS AND ARE FRAGILE. Spread Axle Highboy Trailer. 1/87 Scale Accessory. Scale is approximate. Sorry, no international orders! Trending at $11.99eBay determines this price through a machine learned model of the product's sale prices within the last 90 days. You are buying a new HO 1/87 TNS # 583 Peterbilt 389 w/48' Spread Axle Flatbed Trailer Pink/White - NEW FROM TRUCKS N' STUFF! THESE UNITS HAVE SMALL PARTS AND ARE FRAGILE. 1 "Peterbilt" Semi Truck and 3-axle Cheater Lowboy Trailer 1:87 Scale. Black Peterbilt 389 Sleeper. Super Hauler Peterbilt ". This collectible is a die cast scale model replica. Manufactured by Norscot. Made by Promotex in Canada. 1/87 Scale Accessory. Sorry, no international orders! You are buying a new HO 1/87 Trident # 90068 - M872 3-Axle 34-Ton Flatbed Trailer (No Tractor) KIT. TRUCK STOP HOBBIES CAN NOT ANTICIPATE THE COST OF THESE FEES AND IS NOT RESPONSIBLE FOR THE FEES. You are buying a new HO 1/87 Promotex # 5491 White 53' Reefer Van Great Dane Trailer only. THESE UNITS HAVE SMALL PARTS AND ARE FRAGILE. TRUCK STOP HOBBIES CAN NOT ANTICIPATE THE COST OF THESE FEES AND IS NOT RESPONSIBLE FOR THE FEES. Tonkin: Truck N Stuff Trailer. Grain Trailer w Dual Axle. 1/87 Scale Accessory. Scale is approximate. Item Number:RT4345. two equal-sized white tandem trailers. Die-cast tractor with 2 plastic tandem. Not for Children under 3 years. You are buying a newHO 1/87 Promotex # 5344 Trailer Chassis Parts Set - Red. THESE UNITS HAVE SMALL PARTS AND ARE FRAGILE. HO 1/87 Wiking Green Grey Tractor Trailer Truck MAN Diesel!